Blazor is a new experimental web framework that allows you to write client-side web apps using C# all made possible by WebAssembly. That’s right, C# running natively in the browser. Basically, WebAssembly apps are passed to the browser in an efficient binary instruction format that is able run natively and performantly at near-native speed and this has opened up new opportunities for languages like C# to run client-side in the browser. To demonstrate how easy it is to work with Blazor, we will walk you through a simple example app. To get started with Blazor you’ll need Visual Studio 2019, .Net Core SDK 3.0 Preview, the Blazor extensions form the Visual Studio Market Place and Blazor Templates. You’ll find the installation guide (here). 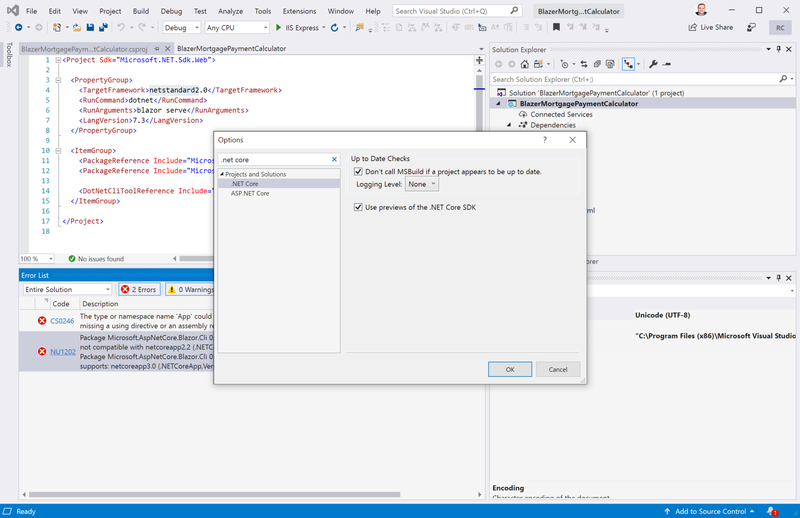 After you’ve installed all the prerequisites, create your first project by selected ASP.NET Core Web Applications. Next, name your project and continue. If you’ve installed everything correctly you should see .NET Core and ASP.NET Core 3.0 in the drop-down boxes with two Blazor templates. For this post we will work with the “Blazor” template. 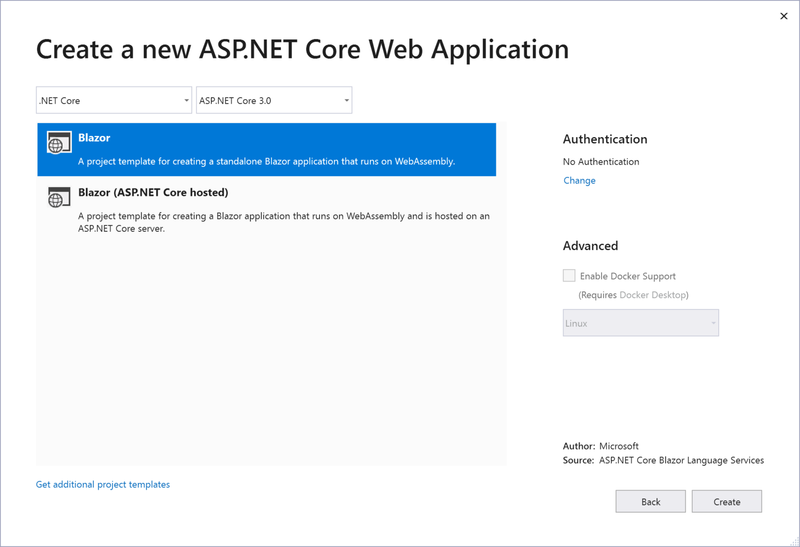 The main instructions don’t call this out directly, but you’ll need .Net Core 2.2 installed to build and run your Blazor applications. If you don’t have .NET Core 2.2, you will get an error when you build your app that reads, “Package Microsoft.AspNetCore.Blazor.Cli 0.8.0-preview… is not compatible with netcoreapp2.2”. You may think as I did that changing the <TargetFramework> to netcoreapp3.0 will fix the issue. It does not, instead changing the target framework will cause a linker error when you build in the Blazor.MonoRuntime.targets file on the line that executes the command “dotnet &quot;$(MonoLinkerPath)…”. If you tried deleting this line and didn’t save a backup of the file, you’ll need to delete the Blazor packages found in the C:\Users\<USERNAME>\.nuget\packages\ directory and reinstall Blazor. So, to summarize, the fix here is leave the Target Framework alone and just the install .NET Core 2.2 SDK. You’ll also want to enable previews of the .NET Core SDK which you can do by navigating to Tools > Options and checking the box “Use previews of the .NET Core SDK”. Release notes for the latest release (0.8.0) as of this post can be found (here). There is a troubleshooting section in the release notes should you get stuck. Inspired by this Stack Overflow post, lets create a simple mortgage payment calculator to demonstrate the power of Blazor. If you’re familiar with ASP.NET, you’ll be very at home with the Blazor development experience. Blazor is essentially Razer views that run in the browser. To begin open Shared > NavMenu.cshtml and add the snippet below to the @NavMenuCssClass div container and save the file. This will add a menu to the app side bar, so you are able to navigate to the calculator page we are going to build. Next, create a file in the Pages directory named Calculator.cshtml. Paste this code snippet into the file and run the example. If you’ve done everything correctly you should see an interactive page that looks like this. Again, if you’re familiar with ASP.NET this is a very low friction development experience. This page took just a few minutes to assemble. The binding experience Daniel and his team has put together looks very promising. Blazor also supports component libraries, dependency injection, debugging and much more. I encourage you to take a closer look at Blazor. For additional learning resources see Daniel Roth’s video published on Channel 9 and also Robert Green’s Visual Studio Toolbox episodes Blazor Part 1 and Blazor Part 2 with special guest Sam Basu and Ed Charbeneau. These videos provide an excellent introduction to the framework.